Pictured from left: Renee Judice of Lafayette, Megan Broussard of Lafayette, Nicole Langlinais of Erath and Brandon Dunphy of Lafayette. Not pictured are Kristi Miller of Lafayette, Blaine LaFleur of Opelousas, Jessica Norris of Ville Platte, Cy Primeaux of Abbeville, Damon Fontenot of Duson, and Dustin Phillips of Lincoln, NE. The UL Lafayette Alumni Association announced the recipients of its endowed scholarships for the 2008 - 2009 academic year. These scholarships have been awarded at $500 per academic year since the Fall 2001 semester. As a result of the Alumni Association’s recent infusion of $100,000 into its 10 existing endowed accounts, the awards now provide $1,000 ($500 each Fall and Spring) to an exemplary student in each academic college and one from the Association of Future Alumni (AFA). The scholarships will be presented this year to: Kristi Miller of Lafayette, an Architecture major, Arts; Brandon Dunphy of Lafayette, an Accounting major, Business Administration; Jessica Norris of Ville Platte, an English Education major, Education; Blaine LaFleur of Opelousas, a Mechanical Engineering major, Engineering; Cy Primeaux of Abbeville, an Applied Science major, General Studies; Megan Broussard of Lafayette, a Public Relations major, Liberal Arts; Damon Fontenot of Duson, a Nursing major, Nursing & Allied Health Professions; Renee Judice of Lafayette, a Nursing major, Nursing & Allied Health Professions; Dustin Phillips of Lincoln, NE, a Physics major, Sciences; and Nicole Langlinais of Erath, a Speech Pathology major, Association of Future Alumni. 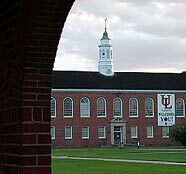 These endowed scholarships were created primarily through the generosity of donors to the Alumni Annual Fund who designated that their gifts are restricted to scholarships and Louisiana motorists who chose to purchase UL Lafayette Prestige License Plates where the fees collected are dedicated to the scholarship program. Awards are distributed from interest earned on funds deposited by the Alumni Association in the UL Lafayette Foundation. The award recipients were determined by the Alumni Awards Committee, which is a standing committee of the UL Lafayette Alumni Council and is comprised of both elected and appointed council members who have volunteered to serve their alma mater. The awards are based upon pre-determined criteria: 3.0 cumulative GPA, full time, senior-level undergraduate student (must have completed 90 hours at the time of scholarship award), and extracurricular activities. For more information or to apply for next year’s awards, visit www.LOUISIANAalumni.org/scholarships or call 337-482-0900.